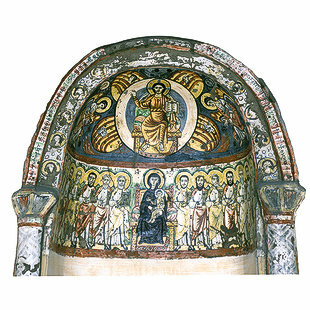 The apse from Baweit is what is called an "Eastern Niche" and it is decorated with two drawings. The upper part portrays the Lord Jesus Christ sitting on the throne surrounded by four creatures with diverse faces. The first has a face of a man, the second of a lion, the third of an ox, and the fourth has the face of an eagle. Around the throne are two angels and two small circles. The first circle is in a light green color, showing the twelve hours of the day, while the second is in a dark color, showing the twelve hours of the night, with the phrase "Holy, Holy, Holy", written around them. The lower drawing portrays the Virgin Mary carrying the Lord Jesus Christ. She is sitting in the middle, surrounded by the Twelve Apostles. The Apostles' names are written above their heads in the Coptic language. On the sides are two other individuals, Saint Nebraha on the right and Pephlos M.B. Slykos on the left. They lived in the village of Baweit. A banner of Coptic writing around the outside of the niche says, "the fruits of the soul are love, joy, and peace."